Volvo, the company most associated with station wagons for the last 20 years, will stop selling wagons in the U.S. The market is drying up. The Volvo wagon had been on life support for months. After dropping the larger V70 Volvo in 2010, Doug Speck, CEO of Volvo Cars of North America, told Automotive News he was giving the V50 another year because there "is a bit more energy in the small wagon segment." Not enough, apparently. Volvo, which was sold to China's Geely in 2010, sold just 480 V50s last year, about two per dealer. Other makers have been quietly dropping wagons for years as their customers flee to more utilitarian vehicles. Growing up in a Connecticut commuter town after World War II in an active family of seven, station wagons were the only practical forms of conveyance. Ford Country Squires, with their acres of imitation wood, were particularly prized. Sportier owners displayed yacht flags representing their initials on the driver's side door. Black Labradors and Golden Retrievers were practically standard equipment. At 16, I took my driver's test in a brown Plymouth Suburban wagon with a rear-facing third seat and a three-speed manual transmission. Luckily, parallel parking wasn't part of the exam. Somewhat later, the Plymouth's transmission linkage developed the habit of seizing up when it got warm. The driver had a choice of wrapping his hands in rags, diving under the hood, and shaking the rods until they freed up -- or driving home in first gear. I shudder to think how we flirted with disaster in those pre-safety-conscious days. On long trips, my parents would fold down the wagon's seats and outfit the passenger compartment with pillows and blankets, where we slid around, un-seat-belted. Long before Ford (F, Fortune 500) got out of the wood-grain-paneling business in 1991, Volvos had become the wagon of choice. Safety had emerged an issue, and so had the environment. Volvos had the twin advantages of looking sensible and being upscale at the same time. It was a boxy European import that looked as wholesome as a bowl of granola. Wagons were part of Volvo's DNA. As the story went, the reason Volvo sedans looked so boxy is that designers would style the wagon first, and then cut off the tailgate and add a trunk. What happened to the Volvo wagon is a classic case of automotive Darwinism. 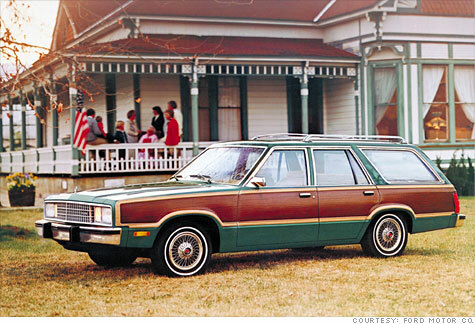 American buyers first turned away from station wagons during the 1973 oil crisis. Their extreme length, emphasized by long rear overhangs to accommodate a third seat, made them natural targets. In the 1980s, the minivan came along and stole the people-mover business. SUVs moved to the fore in the 1990s. Far more utilitarian, they offered a lot more cargo space, a command seating position, and four-wheel-drive. And the 2000s were the decade of the crossover, combining the best features of both van and SUV. With their combination of capability and capacity, they remain one of the fastest-growing segments. Despite its enduring image for safety and solidity, Volvo has been behind the automotive curve for decades. With annual sales of fewer than 400,000 cars, it never enjoyed the scale it needed to support R&D or frequent model changes. It was slow to move production out of high-cost Sweden and never built cars in the U.S., its largest market. Product innovation came slowly too. Volvo never built an SUV, it didn't get around to all-wheel-drive until well after Audi and Subaru, and didn't introduce its first crossover until 1998. Nor did its 1999 sale to Ford help matters. Neither party was able to benefit. Ford tried to integrate Swedish engineering into its cars but found it expensive and prone to weightiness. And Ford technology never made it across the Atlantic, likely because of an unwillingness to share and fear of diluting Volvo's image. Volvo probably did itself a disservice by running testimonials from owners who drove their Volvos for years and years. When you put a million miles or more on a car, it limits the opportunity for repeat business. Audi, BMW, and Mercedes still offer wagons for sale in America, although they don't call them that. At Audi, "avant" is the preferred designation; BMW uses "touring," and Mercedes likes "estate." Sport wagons, though, have never made much of an impact. Cadillac's CTS is a spectacular offering, but its tightly tailored body and rear liftgate have limited its appeal. Volvo plans to soldier on with its well-regarded line of crossovers: the XC60, XC70, and XC90. Before I get carried away by nostalgia, caution should be observed in writing off an entire vehicle segment, because they do have a habit of coming back to life. The 1976 Cadillac Eldorado was lionized as the last American convertible -- until Lee Iacocca brought out the 1982 Chrysler LeBaron ragtop. The station wagon may rise again. 2011 Volvo S60 -- the naughty Volvo?